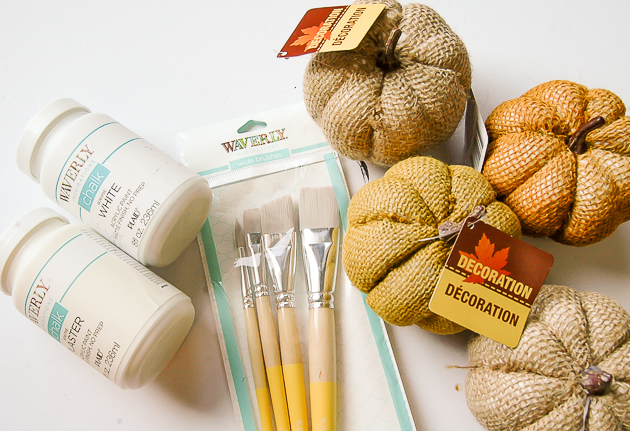 How to give Dollar Tree pumpkins a neutral farmhouse makeover! If you follow me on Facebook you may have seen my latest Dollar Tree haul. I went on a little shopping spree and hit up two Dollar Tree stores in my area. 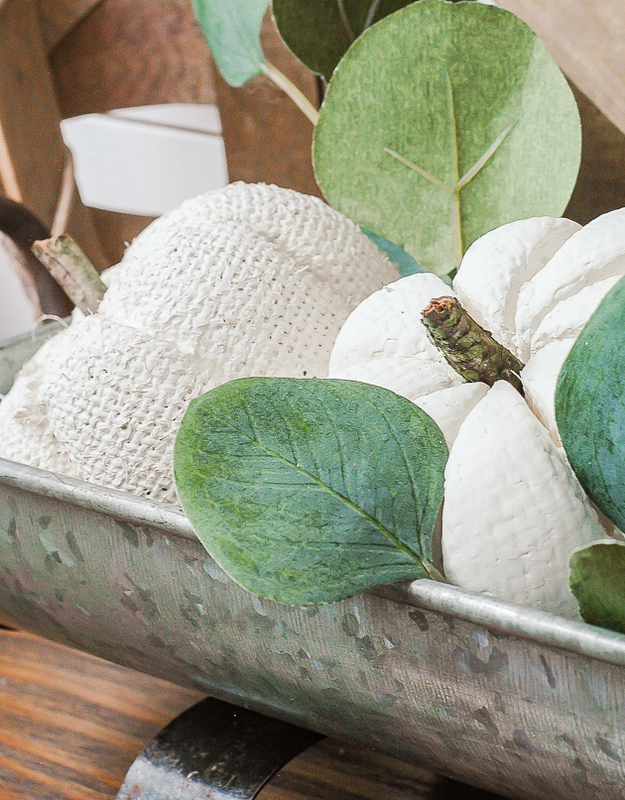 I was in search of fall and Halloween decor and I found some great items. 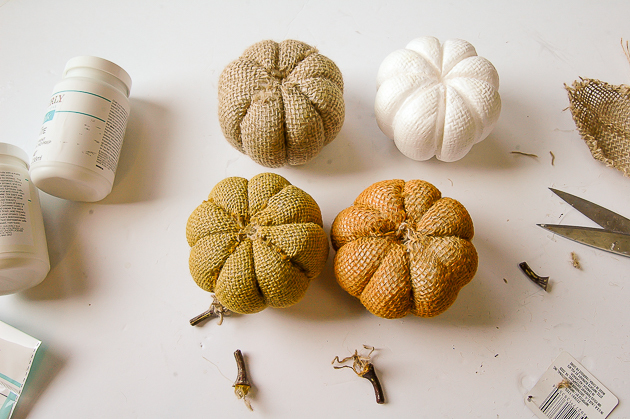 One of my favorite finds were these little burlap covered pumpkins. 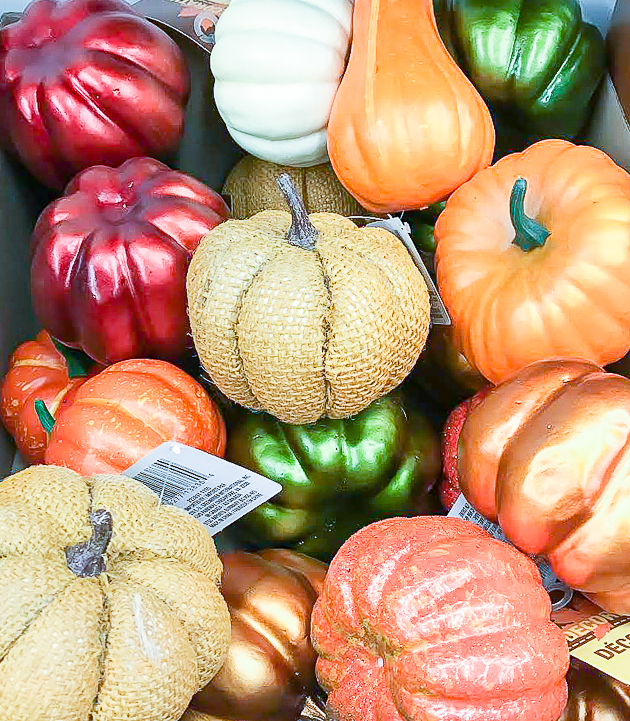 I've bought many Dollar Tree and other inexpensive pumpkins in the past, but I couldn't resist these little guys. 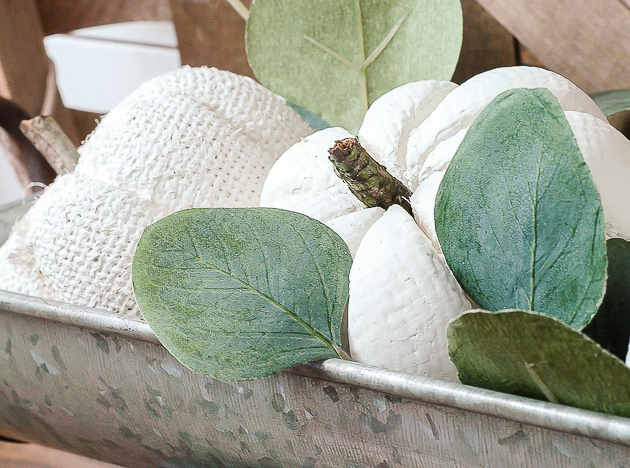 The burlap gave them the pumpkins the perfect amount of texture and I knew they would make a great addition to my neutral fall decor. I started by removing the stems of each pumpkin with a pair of scissors. 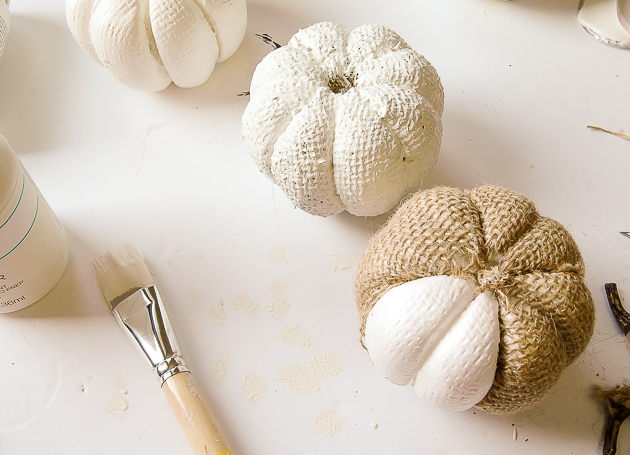 While doing this, I accidentally pulled off a section of burlap from one of the pumpkins. This little whoops ended up being a happy accident because I actually liked the texture that the burlap left on the Styrofoam. 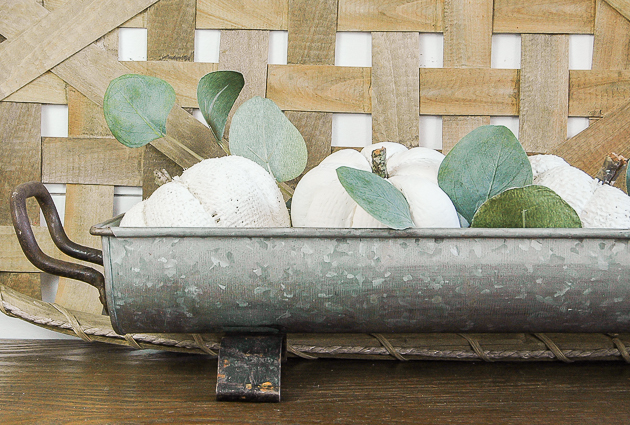 Don't you just love when DIY and craft accidents turn out to be a good thing? 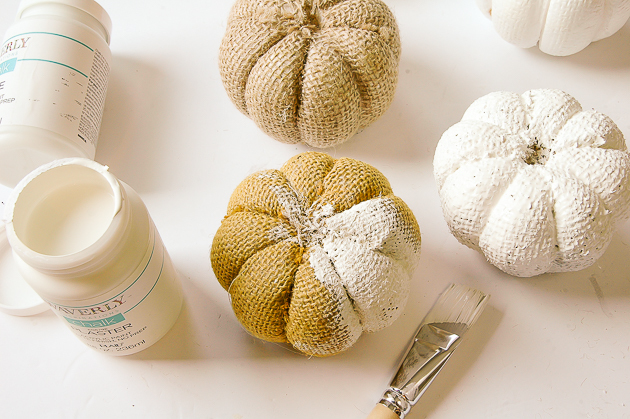 After I had the stems removed (and the burlap from 2 pumpkins) I gave each one two coats of plaster chalk paint. After the paint was dry I hot glued a piece of wood to make a new stem for each pumpkin. Don't you just love the texture? 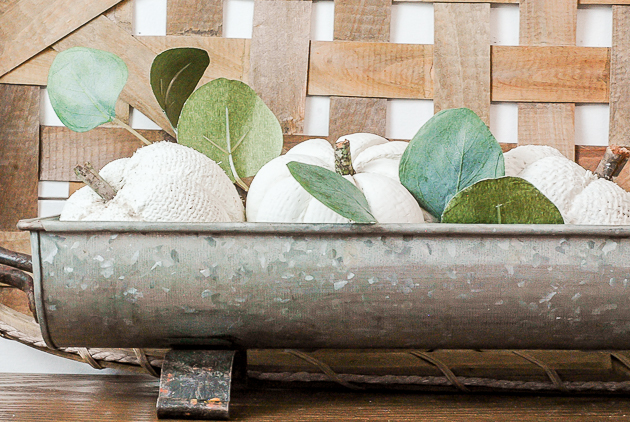 I placed the pumpkins in a small galvanized trough with a few eucalyptus leaves and I absolutely love how they turned out. 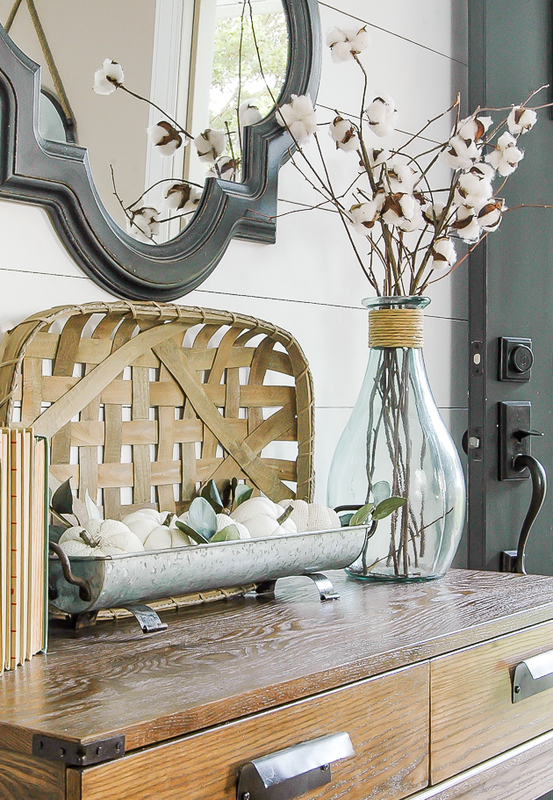 I was planning on using them in a centerpiece for the dining room table, but I'm actually really liking them in our entryway. 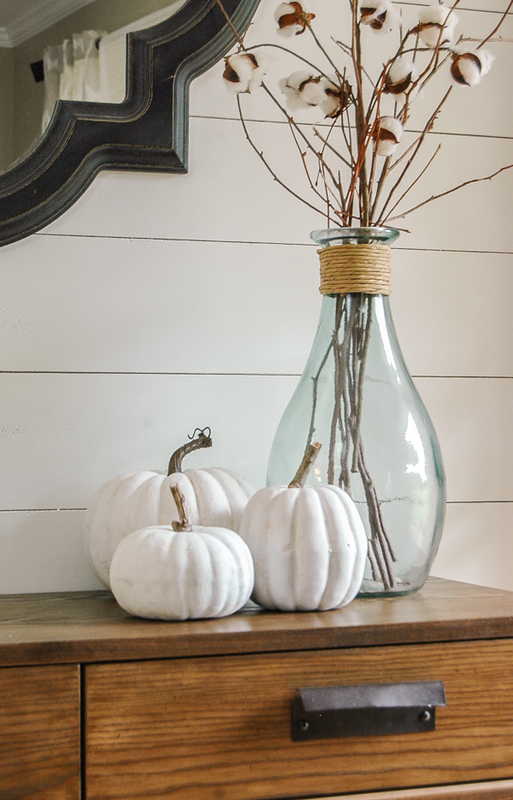 I can't promise this area will stay this way all fall (I'm having way too much fun tweaking my fall decor), but for now these adorable Dollar Tree painted pumpkins make the perfect addition to our entryway. Can't talk now, running out to the dollar store, lol! Cute! I love that mirror so much. I found a 5 pack of mirrors that shape, one large and four smaller. My husband was to get them as my Christmas gift but they were sold out. I found the set again and I didn't have the vehicle space and had to pass them up again. I will find them! 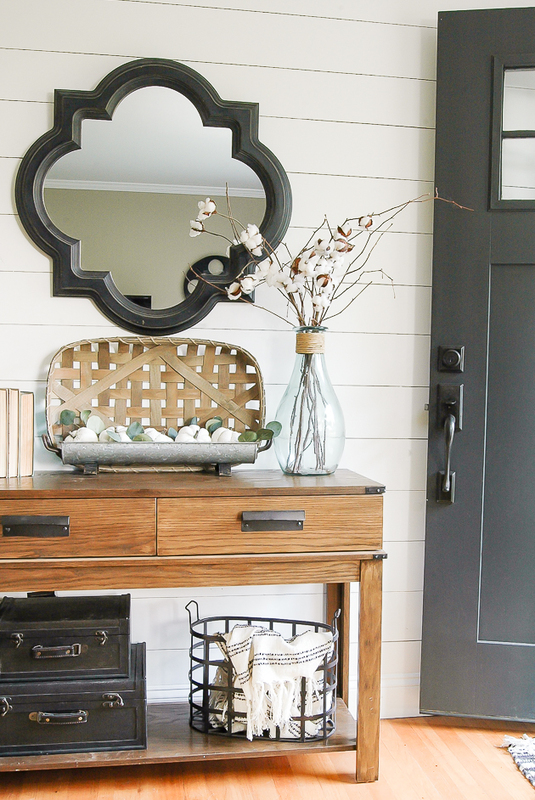 Your entryway is the inspiration for mine in my new home, so thank you for sharing the door paint color! Love these little pumpkins! Great minds think alike--I bought a bunch of these and have been doing the same thing! 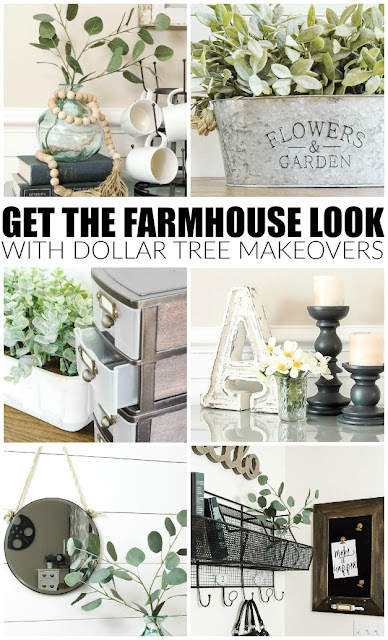 I did not buy the burlap ones, but seeing yours, makes me want to go get some burlap ones and paint them! I also like your idea of removing the stems and replacing with pieces of sticks. Great idea! 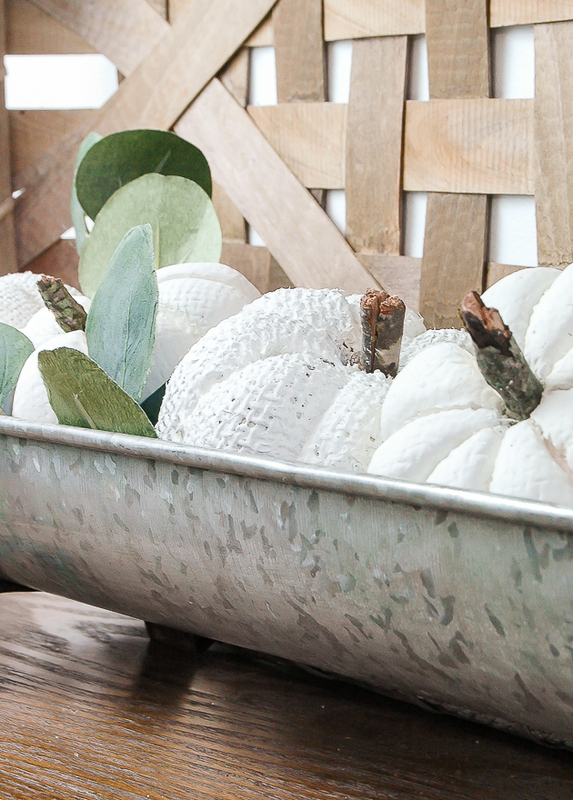 I love the way your pumpkins turned out ~ and adding the stick stems was a great idea! Thanks so much for sharing your idea!